When Chiu Keng Guan was around 16, he read a book entitled I Can Do It, So Can You. It was the autobiography of Taylor Gun-Jin Wang, a Chineseborn American scientist who became the first ethnic Chinese to go into space. “This book was very inspiring to me because I have always been interested in space and UFOs,” says the 46-year-old. But fate led Chiu on a totally different path. He became a successful film director, producing hit films such as The Journey (2014) and OlaBola (2016). However, he has never forgotten his dream of becoming an astronaut. 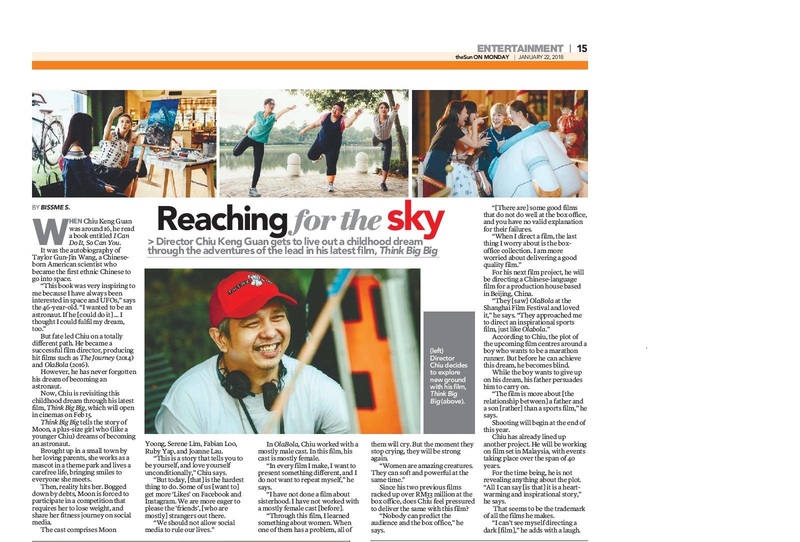 Now, Chiu is revisiting this childhood dream through his latest film, Think Big Big, which will open in cinemas on Feb 15. Think Big Big tells the story of Moon, a plus-size girl who (like a younger Chiu) dreams of becoming an astronaut. Brought up in a small town by her loving parents, she works as a mascot in a theme park and lives a carefree life, bringing smiles to everyone she meets. Then, reality hits her. Bogged down by debts, Moon is forced to participate in a competition that requires her to lose weight, and share her fitness journey on social media. The cast comprises Moon Yoong, Serene Lim, Fabian Loo, Ruby Yap, and Joanne Lau. “This is a story that tells you to be yourself, and love yourself unconditionally,” Chiu says. In OlaBola, Chiu worked with a mostly male cast. In this film, his cast is mostly female. “In every film I make, I want to present something different, and I do not want to repeat myself,” he says. stop crying, they will be strong again. Since his two previous films racked up over RM33 million at the box office, does Chiu feel pressured to deliver the same with this film? “Nobody can predict the audience and the box office,” he says. “[There are] some good films that do not do well at the box office, and you have no valid explanation for their failures. For his next film project, he will be directing a Chinese-language film for a production house based in Beijing, China. “They [saw] OlaBola at the Shanghai Film Festival and loved it,” he says. According to Chiu, the plot of the upcoming film centres around a boy who wants to be a marathon runner. But before he can achieve this dream, he becomes blind. While the boy wants to give up on his dream, his father persuades him to carry on. “The film is more about [the relationship between] a father and a son [rather] than a sports film,” he says. Shooting will begin at the end of this year. Chiu has already lined up another project. He will be working on film set in Malaysia, with events taking place over the span of 40 years. For the time being, he is not revealing anything about the plot. “All I can say [is that] it is a heartwarming and inspirational story,” he says. That seems to be the trademark of all the films he makes. “I can’t see myself directing a dark [film],” he adds with a laugh.